Fine Art by Rusudana Glonti: The Aberdeen Art Fair Been and Gone! 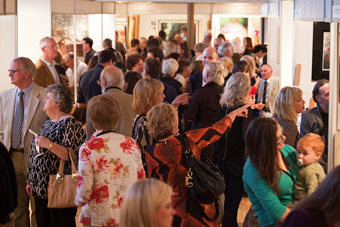 The Aberdeen Art Fair 2013 which took nearly 8 months of my focused attention and preparation finally took place in the middle of last August. It was a very exciting and exhausting event, but overall a very good experience. It allowed me to meet a lot of people: other artists, galleries’ owners and of course potential customers. I learned a lot of useful information, made a few sales and established some contacts. The exhibition was very well attended (mostly due to the prime location of the venue as well as good advertisement) and throughout the 3 days of the fair there were thousands of people passing through the exhibition hall, looking at the art work, asking questions, making comments or simply stopping to chat with the artists. It is quite challenging to be on your feet all day trying to look fresh and alert and not even having time to sneak out for a quick snack at lunch time. But I should not be complaining because I heard a great amount of nice comments and compliments about my art work from the visitors and at the end of the day that is all that matters! Overall I think it was a very worthwhile experience!